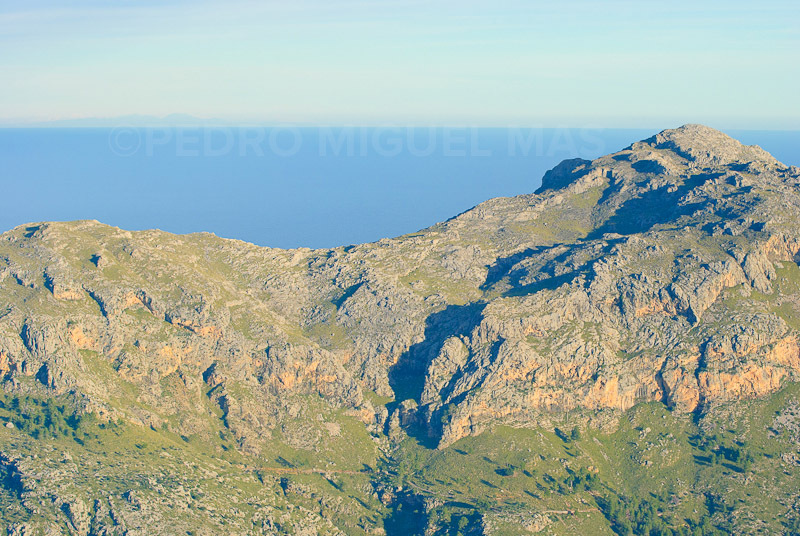 Puig Roig (1002 m), Mallorca, right in front. 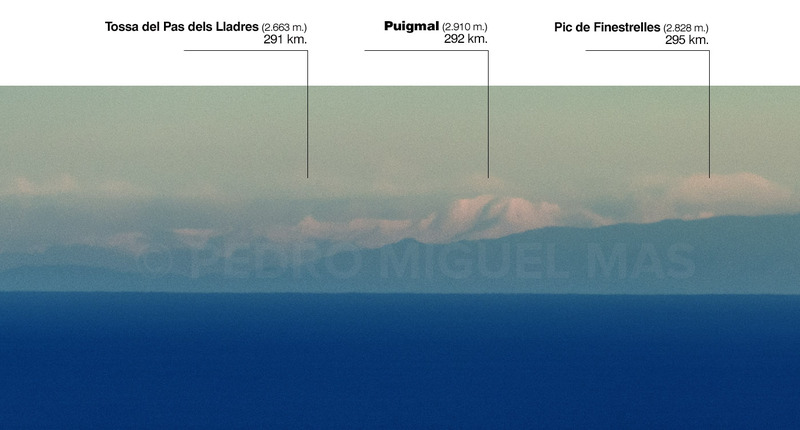 Far on the horizon, the silhouette of Montseny (1714 m), 220 km away. It was a fine day of December. I went out for hiking, as I usually do on weekends. No photo shooting session this time, just my usual basic photo equipment in my backpack. After a light snowfall some days ago, I decided to hike to the top of Puig de Massanella via the north face. When I got to the “Cases de Neu plateau”, at about 1000 meters high, near Galileu mountain, at about 9,30 am, I clearly noticed a mountain silhouette far on the horizon, just in line with nearer Puig Roig, only 4 miles away in front of me. Puig Roig (1002 m) mountain in the foreground. On the horizon, the silhouette of Montseny (1714 m), 220 km away. Dry NW winds had cleaned the atmosphere the day before, so on the horizon I could perfectly spot the Serra del Montseny mountains in Catalunya. I quickly took out my tele lens from my pack and quickly looked for a place to shoot some pictures. It was a pity I was not carrying my “best” camera nor my most powerful tele lens. I had to be happy using a 70-300mm. lens I carried with me. After a few shots at half focal distance, in order to include the top of Puig Roig, I decided to shoot at maximum focal (300mm). This way I could capture distant Catalunya mountains over the horizon with all detail. As I was only carrying my light tripod for hiking, it did not help me very much, but I rather used it as a support for shooting a panoramic composition of all that faraway silhouette. Once the photo session was ended, I carried on with my hike, on the way to Massanella top. As time passed and the sun was higher in the sky, the silhouette vanished. Upon reaching the top of Massanella, the silhouette was not longer there. I went back home very happy as per the pictures I could take and because of the mountain hike, as it was a year already since I did not stepped on snow in the island. Recently I sent these pictures to my mate Marcos Molina. I was ever so happy because I captured Montseny mountain, which I’ve never seen before. I got a shocking answer from him, after he’d developed my raw pictures. The photos came with a big surprise: behind the silhouette of Montseny mountain, there was the snowy mountain of Puigmal, even farther: the Pyrenees !! < Previous Cerro de los Guardas – Veleta | 63 km. Next > Cantavieja – Monte Perdido | 260 km.